In our system, we couldn’t have done it the way you did. In our system, if I had given a press conference, then the leader of the opposition would have given one, and that would have followed the next day, and then the other parties would have given one, and that would have followed the next day. You have a system that once the president is the president, there is no leader of the opposition. There is no kind of ‘president-in-waiting,’ and I think the fact that we have an opposition which is always an alternative government makes it very different. We’re available to the press for interviews from time to time. But you don’t want to over-do it. Thatcher so ably explained and articulated the principle features and virtues of Westminster parliamentarism, from the Prime Minister’s weekly audiences with the Queen and how liberty is best served by separating a head of state from a head of government into two offices, to the confidence convention, to the importance of loyal opposition, and why proper parliamentary debate and Prime Minister’s Questions are integral to Responsible Government. More importantly, Thatcher showed why all these features of Westminster parliamentarism – particularly loyal opposition and how the opposition holds the government to account in the assembly – are inextricably bound up with one another in as part of an organic whole. In a parliamentary system under Responsible Government, the government and opposition both reside within the assembly. The Ministry is responsible all acts of the Crown and must retain the confidence of the assembly in order to continue governing. Ministers introduce government policies in the assembly, and the opposition raises questions about and offers alternatives to them in the assembly. Through parliamentary privilege, members enjoy absolute freedom of speech in the chamber and immunity from charges of defamation. Ministers must prepare answers to the questions that opposition members are likely to ask, but the debates retain some spontaneity and put the government and the opposition on an even footing. The proceedings of the Legislative Assembly of Alberta are televised, so Albertans can judge the merits of the government’s plan without being subjected to an expensive and scripted televised address. In contrast, the American presidential system relies on a strict separation of powers between the executive and the legislature, and voters elect each branch separately. The president does not depend upon commanding the confidence of Congress. The US Constitution entrenches this strict separation of powers through the Emoluments Clause, which prohibits members of Congress from holding any executive office, such as the cabinet, and likewise prohibits any executive officer from sitting in Congress. As such, the Emoluments Clause prevented cabinet government from ever evolving in the United States. Congress can summon executive officers and compel them to testify, but in those hearings, congressional representatives and executive officers are not on equal footing. Those executive officers are answerable to Congress but accountable to the President. They have to hold the confidence of the President but not the confidence of Congress. As Margaret Thatcher suggested to Brian Lamb, press conferences variously held by the president and the congressional leadership serve as the closest equivalent to Question Time in the United States – but journalists, and not elected representatives, pose the questions, and the president and congressional leaders are not required to hold the press conferences in the first place. The president and the congressional leadership react and respond to one another’s press conferences through the intermediary of the press, but they don’t debate and question each other directly. Members of Congress are also limited in what they can say during press conferences or interviews outside the House or Senate chambers themselves because, like Canadian parliamentarians, they enjoy parliamentary privilege and freedom from being charged with defamation only when they speak in the chamber. In addition, the President’s State of the Union Address is roughly equivalent to the Speech from the Throne. A custom or convention has emerged in the United States where the television networks broadcast the President’s State of the Union, wherein he lays out policies that he asks Congress to consider, and then broadcast a “response” from the party that does not hold the White House. (I go into more detail on this custom here). The President’s State of the Union and the opposition response are both scripted. On 24 March 2015, the networks in Alberta adopted this American system of televising a scripted speech from the government and a scripted response from the opposition. Premier Prentice, leader of the Progressive Conservative Party of Alberta, outlined his government’s upcoming budget, and David Swann, leader of the Alberta Liberals, submitted a scripted video wherein he criticized the Prentice government’s previous policies, but not the budget that he had not yet seen. The Government of Alberta paid for both these videos for a total cost of over $100,000. The Wildrose Party – still the Official Opposition – opted to upload its “response” to YouTube for free rather than allowing the Government of Alberta to spend $29,000 on its response. Wildrose officials also told the Calgary Herald that they also refused the Government’s offer to finance their “response” video because they “wouldn’t know the contents of [Prentice’s] speech” and thus could not respond to any specific points that Prentice raised. As you can see from these videos, these sterile, scripted television addresses destroy any last vestige of spontaneity from political debate – and preclude parliamentary debate altogether. They start with self-congratulatory soundtracks with the Albertan flag fluttering in the background against an optimistic blue sky – a very clever use of priming the audience to hold favourable views toward Prentice and Swann. But they reduce politics even more to public relations and turn politicians into actors. The leading man, “Grim Jim” Prentice, as if he was channelling President Franklin D. Roosevelt’s fireside chats, sat down on a table with solemn clasped hands under the false pretense of familiarity; the perfectly positioned flags of Canada and Alberta framed the focus-grouped scene. Prentice told Albertans that only he – with a new electorate mandate in a new parliament – could save the province from financial ruin. Prentice presumptuously proposed a “10-year plan,” which would therefore take at least 3 parliaments to implement, since Alberta’s fixed-date election law reduces the maximum life of a legislature to 4 years. He then had to audacity to pretend that his televised address did not infringe upon the Budget Secrecy Convention. Speaking directly to “The People of Alberta, who have so much at stake,” Prentice stated that the Minister of Finance would table the budget in the legislature and emphasized that he “can’t pre-empt the budget and what will happen in the legislature.” By definition, the very act of making this televised address and outlining the budget pre-empts parliamentary debate. While he spoke in ambiguous, carefully calculated bureaucratic language, he intimated that the upcoming budget would include a healthcare user fee of some kind, though he ruled out establishing a sales tax. Nevertheless, he announced new policies, and he has already stated in various interviews that he would seek a new mandate from Albertans on this upcoming budget and the new policies that it contains. Dr. David Swann, leader of the Alberta Liberals, started his scripted televised address by greeting his “fellow Albertans”. Since he could not possibly have known the content of Premier Prentice’s scripted televised address, he simply laid out the policies that a Liberal government would put forward. He focused mostly on social issues, like education and healthcare, and spending on infrastructure and pledged what would have to amount to hundreds of millions in new spending and new taxes. Like Prentice, he invoked the standard emotive anecdotes about being a grandfather, etc. Heather Forsyth, then interim leader of the Wildrose Alliance and Leader of the Official Opposition, delivered her “response” to Premier Prentice via a live feed on YouTube and thus avoided charging the Government of Alberta for the costs of producing a televised address and buying airtime. She sounds like a female version of Senator Harry Reid (D-NV). She criticized the government’s high level of expenditure, wasteful spending and overall inefficiency, and corporate welfare. This demagogic Albertan Model of televised addresses to “the people of Alberta” draws inspiration from these American customs surrounding press conferences and the President’s State of the Union speech – but it is divorced from the separation of powers of presidentialism. In any case, American Presidents would also never make special televised addresses for something as mundane as a budget. As Margaret Thatcher said, when the first minister gives a press conference or a speech, the other leaders must then scramble for air time and media attention and give speeches of their own. The Americans have adopted this custom because they lack a parliamentary system where the government faces the opposition — the government-in-waiting — in the assembly. But in a parliamentary system, these press conferences and televised addresses remove public and policy debate from the legislature, where they belong, and make a mockery of Responsible Government and parliamentary privilege alike, because the government can script its statements without facing questioning, and thus shirk responsibility for some of its executive decisions, and because the opposition MPs lack the benefit of freedom of speech and the ability to pose questions directly to government ministers. By relying on this American custom of televised addresses, the party leaders can talk to you, “the people of Alberta,” but they can’t talk to each other — you certainly can’t talk to them. Prentice undoubtedly violated the Budget Secrecy Convention by outlining key measures in the upcoming budget outside the legislature. I would go further and argue that Prentice put himself in contempt of parliament. (It would not amount to a breach of parliamentary privilege, however). the intentional advance disclosure of Budget contents outside the House lessens the role of the legislature, deprives it of its ability to discharge its proper functions, and diminishes the respect due to the House. When the government or a member claims that a Budget presentation is needed outside the House well before it happens inside the House in order to communicate directly to the people or because of a perceived flaw in the parliamentary institution, there is a danger that the representative role of each and every member of this House is undermined, that respect for the institution is diminished, and that Parliament is rendered irrelevant. Parliamentary democracy is not vindicated by the government conducting a generally one-sided public relations event on the Budget well in advance of members having an opportunity to hold the government to account for the Budget in this Chamber. The same principles apply to the Prentice government in Alberta. By presenting the budget outside of the legislature, Premier Prentice has fundamentally undermined and eroded yet further parliamentary government and loyal opposition in the province of Alberta. Premier Prentice should have announced this budget in the Legislative Assembly of Alberta with no additional costs. Instead, the Government of Alberta spent $75,000 so that the Premier could outline his government’s upcoming budget as the leader of the Progressive Conservative Party of Alberta and prime Albertans for the early election that he has been talking up for several months. The opposition parties should have protested Prentice’s dangerous precedent and tabled a motion to hold him in contempt. A distinct political culture of the Province of Alberta has emerged. It has fused the authoritarian tendencies of presidentialism with the over-lapping legislature and executive and confidence convention of parliamentarism, but it has rejected both the strict separation and independence of executive and legislative powers of presidentialism and the effective intra-cameral opposition between Her Majesty’s Government and Her Majesty’s Loyal Opposition of a parliamentary system. In December 2014, Premier Prentice re-affirmed and secured the veritable personal union between the leadership of the Progressive Conservative Party and the premiership of the Government of Alberta by co-opting and destroying the Wildrose Alliance, the most effective opposition party that the legislature of Alberta had seen since the early 1990s. 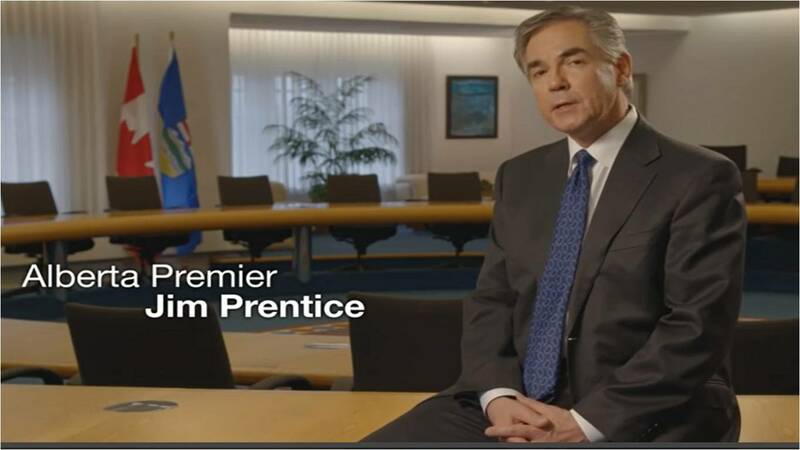 Throughout 2015, Prentice has hinted that he would advise an early dissolution of the 28th Assembly in order to seek both a personal mandate for his premiership, which he took on mid-parliament, and a mandate for his government’s budget and new policies that they have adopted in light of low oil prices. Prentice outlined the basic elements in his government’s budget during his televised address and, in my view, committed a prima facie contempt of parliament that makes a mockery of responsible parliamentary government. Since Prentice has already eliminated the most effective opposition and most plausible alternative government, the Progressive Conservative Party of Alberta stands poised to win yet another parliamentary majority in the upcoming general provincial election. In short, Alberta has evinced the most effective dictatorship in the Western world: the one-party quasi-presidential State. Long live the People’s Republic of Alberta. Until Anthony Blair’s premiership, the British Prime Minister did Prime Minister’s Questions twice weekly, on Tuesdays and Thursdays, for 15 minutes. Blair consolidated the two sessions to one 30-minute PMQ each Wednesday. James Wood and Darcy Henton, “Prentice Says Albertans Will Pay New Health Free As Part of Fiscal Plan,” Calgary Herald, 25 March 2015. Ontario, Legislative Assembly of Ontario, 40th Parliament, 2nd Session, Speaker’s Ruling, 14 April 2014. This entry was posted in Loyal Opposition, Parliamentarism v Presidentialism. Bookmark the permalink. I won’t defend Premier Prentice’s discussion of budgetary measures in his TV Address, but I will submit that this practice did not originate with him nor in Alberta. The practice of a Prime Minister / Premier addressing the people in a time of crisis is not at all new in Canada. I believe the first such TV Address was Prime Minister Trudeau announcing the invocation of the War Measures Act during the October Crisis of 1970, and PM Trudeau made at least one more TV Address in 1974/5 to announce the introduction of ‘wage and price controls’ — which is a budgetary measure. PM Brian Mulroney made at least one TV Address at the failure of the Meech Lake Accord in June 1990. The country was so atrociously divided between Quebec and English Canada that he made two separate Addresses in English & French rather than combining two languages in one Address. In 1989 the Mulroney PC Government’s Budget was leaked in advance to Global TV, and so Finance Minister Michael Wilson actually released the Budget to the Media at a Press Conference. The Liberal and NDP Opposition was so outraged that, when Wilson formally tabled the Budget in the House of Commons the following day, they walked out of the House on mass in protest! In October 2012 Ontario Premier Dalton McGuinty made a TV Address to his Caucus to announce his resignation as Premier, and announce the prorogation of the Legislature. So, what just happened in Alberta is not new except for giving the Opposition Leaders an opportunity to also Address the people. I don’t think this was an ‘American’ practice as much as Jim Prentice simply trying to be fair to the Opposition. This Alberta Premier’s Address would never have happened were it not for the very serious economic and fiscal crisis facing Alberta. This is not going to become a normal practice. What concerns me much more is the marginalization of the Queen’s Christmas Day Message. It used to be that Christmas messages were reserved for Her Majesty, and the Governor General / Lieutenant Governor and Prime Minister / Premier gave their Message on New Year’s Day. Now the GG / LG / Prime Minister are releasing their Messages on Christmas Day which is marginalizing media coverage of the Queen’s Message. Furthermore, the CBC used to broadcast the Queen’s Message three times at Noon, 6PM & 11PM, but now CBC broadcasts it only once at Noon. CTV used to broadcast it, but now does not. Parliament should bring in a Law forcing them to broadcast the Message. The political intrusion into the Sovereign’s Christmas Message is taking these political TV Addresses too far, and is a matter of greater concern. Thank you for informing me about this other terrible precedent against the Budget Secrecy Convention in 1990, where Wilson divulged the budget to the media. That’s the sort of obscure reference that is difficult to find in scholarly journals and books, and I couldn’t possibly remember it from my own experience because I was only born in 1988! I take your point that this practice of televised addresses is not exclusive to Alberta. The federal Prime Ministers have occasionally done televised addresses, and Trudeau did set that precedent in the October Crisis, as you say. The CBC Archives contain all the prime ministerial “addresses to the nation,” like Mulroney after Canadians voted down the Charlottetown Accord and Chretien in 1995 in the lead up to Quebec’s second referendum. But I would still maintain that this case in Alberta is different for at least two reasons. 1. When the Prime Ministers have given televised addresses, they do so in true emergencies or crises AND they alone speak in order to inform the public directly. The Prime Minister and Leader of the Opposition don’t produce competing videos and try to hold a debate on the television and outside of the Commons. Harper has deviated from this model, and in December 2008 both he and Dion got network airtime. And in October 2014, after the terrorist attack in Ottawa, Harper, Trudeau, and Mulcair all spoke. I also oppose those instances of televising addresses. 2. Alberta is unique in Canada for its history, from 1905 to present, of a series of political dynasties and one-party rule. Alberta has never benefitted from a consistent, serious, and competitive opposition party. So when the Premier of Alberta takes to the airwaves and addresses “the people of Alberta,” he is, essentially, launching a campaign speech. The only federal example that comes close occurred in December 2008 — but at least then the Conservatives on the one hand and the Liberal-New Democratic coalition on the other were evenly matched. The overall production and presentation are also very similar to the State of the Union “opposition response” format, where in this case the premier and opposition leaders took to the airwaves not because of a true emergency or crisis, like we’ve seen at the federal level, but merely to debate basic policies and party platforms as they would in a normal day in the legislative assembly. This is precisely what happens each January in the United States after the State of the Union.